The Macao Artist Sou Farong created an oil painting “Ascension” in 2007, which originally painted on rice paper. The painting represents 16 stylish goddesses dancing in the sky and was invited to make a reproduction of a ceramic plate 3.6 X 1.2 meters which was exposed in Shanghai Expo. The painting was subsequently selected among other artistic works, to be put into the Shenzhou 8 space capsule launched into space on 1st November 2011 and returned to Earth on 17th of the same month. Macao Post produces a Gift Set of Porcelain Plate Painting “Ascension” with this meaningful artistic work. 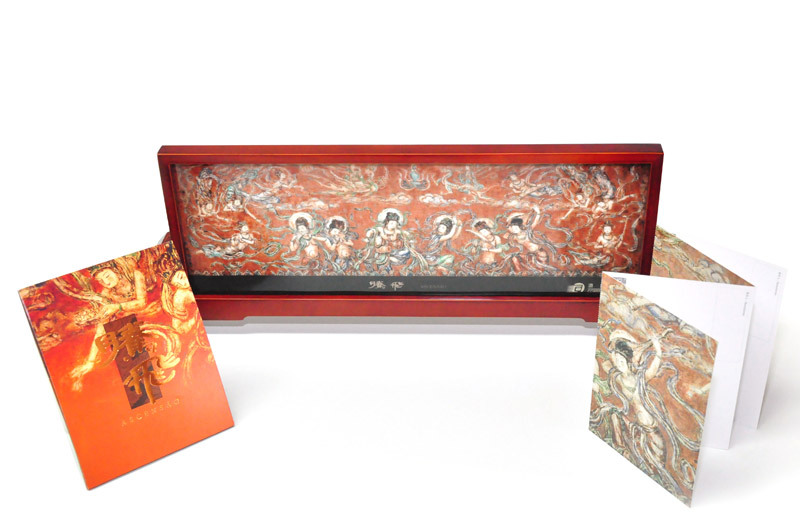 The gift set will be launched on 6th January 2014, includes a reproduction of the porcelain plate painting and the first set of the "se-tenant" postcards (4 pieces) of Macao Post. The selling price of this gift set is MOP618.00 and it is exclusively available at the Philatelic Shop of Macao Post Headquarters. It is certainly a precious collectable as well as an elegant gift. Limited quantity! Get the opportunity!